Note: The Serial Number is not needed to find parts, because it is used solely for your own records. 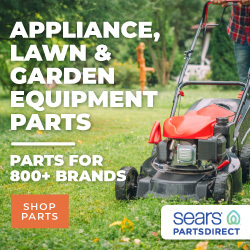 The best way to find the correct part numbers is to use new appliance parts outlets like, SearsPartsDirect.com, and AppliancePartsPros.com . They have the appliance manufacture's complete diagram "breakdowns". Use your model number in their search bar, to find the part you need in the drawings. Then find the original part number that associates to the diagram number. That being said, most control boards and circuit boards do have their own part number printed right on them. Best bet here is to remove the part you are replacing and compare the part numbers on the sticker. Be aware that some circuit boards have a lot of different numbers printed on them. So the question then becomes, how do we find the right number? You can simply enter those numbers in the search bar above to see in-stock-availability, or open another window and search Google images to compare those numbers until you are convinced you have found the right one. Please do not order a part just because it looks similar to what is currently in your machine. Appliance parts look the same, but they are not the same. Wiring, function, fit etc. could be different, and thus make the part unusable. Each part has an individual part number that is model specific. So please be certain that the part you are ordering, is the one you need. Whew! O.K., we know that is a lot of information, but if you are willing to do those few easy time-saving steps, then we can help you save up to 75% off the cost of new parts!